The traditional anniversary clock which runs for over a year with a single winding makes an excellent presentation gift as a continuing reminder of the date of a special occasion. These clocks are a popular item to give as a special gift, particularly to commemorate the passage of time. For example, clocks and watches are often presented as a token of appreciation for a person’s length of service to an organization such as a retirement gift or to acknowledge years of service to a volunteer group. A newer interpretation of the idea of an anniversary clock is also a commemorative one but in this case celebrating the number of years of existence of a company or organization. For example, there are currently clocks celebrating 100 years of Ford automobiles and 50 years of Corvettes. These clocks may be of interest to car enthusiasts but, in these examples, the clocks themselves are just ordinary round wall clocks with pictures of cars instead of numbers to indicate the hour. When clock collectors talk about an anniversary clock they mean the original Anniversary Clock style from 1901. They are also known by the name glass dome clock and 400 day clock. 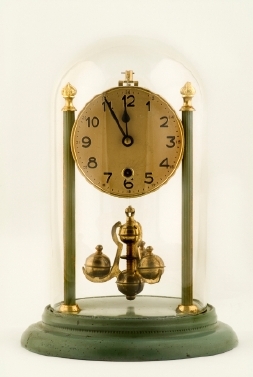 In 1901 the Bowler and Burdock Company of Cleveland, Ohio introduced a unique clock that was sold under a glass dome. Clocks of the era normally ran for 8 days or 30 days on a single winding of the spring with the clock key. However, the new clock ran for a full 400 days on a single winding with the key. It was named Anniversary Clock because one could remember to wind it once a year on the date of some special occasion. Wedding guests found that they made an excellent gift for the bride and groom, a gift that kept giving when it was wound on every wedding anniversary. For anyone who is familiar with the clockmaking history of the United States, clockmaking declined in the United States during World War II because the clock manufacturers converted to making war material and after the war, many clock makers were not successful at returning to clockmaking. However, the Bowler and Burdock Company were able to resume production of their 400 day clocks which became a staple wedding gift as soldiers returned from war and began their families. Since these clocks were so popular, during the 1950’s there were about 125 different models of 400 day clocks produced by over a dozen clock manufacturers. However, like many other consumer items, this craze died down and so did the number of domestic manufacturers. By the 1960’s there were only 5 companies in the U.S. that continued to make these glass dome clocks. While there were about 125 different models of 400 day clocks, all of them followed the original design of Bowler and Burdock Company. A full size or standard 400 day clock is typically 12 inches tall while the miniature one is around 9 inches tall. They have a circular brass base about 6 inches in diameter, although some newer clocks feature a glass or porcelain base. The dial is generally made from white porcelain and polished brass columns or their equivalent support the dial. An intriguing feature of these clocks is the use of a torsion pendulum instead of a pendulum that swings back and forth. The torsion pendulum is suspended from a thin wire from the clock mechanism behind the dial and rotates in one direction for half a turn then in the other direction for half a turn. In traditional anniversary clocks the torsion pendulum is designed as four connected brass balls which rotate back and forth. The shiny brass torsion pendulum suspended inside a glass case with a polished brass base and columns makes an eye-catching accent item for a home’s décor, adding to the popularity of the clock. However, the same mechanism that was interesting to watch was also delicate. Some people had so much trouble keeping them running that they ended up no more than a fancy decoration on the shelf. While the average key wind 400 day clock could run for a year without winding, the accuracy would be maintained for only a few weeks at a time. The original key wind anniversary clocks require a skilled person to handle repairs. Anniversary clocks continue to be made today and still make an eye-catching addition to the home. Modern ones are moderately priced and run on batteries or contain a quartz movement. A testament to their continued popularity is the fact that the Hermle clock company currently offers 28 models of these clocks. You can usually find these clocks at fine furniture stores, although the new ones are usually quartz movements. If you want the real 400-day mechanical clock, they will be harder to find. Antique stores or a store selling collectibles may have one. You also might try a large jewelry store that carries clocks. One of the best places to find all kinds of antique and collectible clocks is on eBay. New to eBay? It's easy to register and only takes a few minutes.